We use an microscopic vibrating tip mounted on the end of a cantilever to probe the mechanical, elastic, and thermal properties of surfaces on tiny length scales, of the order of 1 nanometre (10-9 m). One technique is called Ultrasonic Force Microscopy (UFM), based on atomic force microscopy. A tip on the end of a cantilever is vibrated in contact with a sample surface at a very high frequency in the megahertz range (106-108 Hz). The force between the tip and the sample depends in a nonlinear way on the position of the tip, and we exploit this to induce a low frequency kilohertz tip vibration by modulating the amplitude of the megahertz vibration at this low frequency. Then by scanning the tip laterally across the sample and monitoring this kilohertz vibration, we can make an image of the elastic properties of the sample on nanometre length scales. This shows an image of germanium quantum dots only 15 nanometres high on a silicon substrate obtained with UFM at 60 megahertz. We can even resolve here small changes of elastic constants inside the dots due to the high levels of strain induced during the dot growth. We have also developed a technique to image sub-surface variations in thermal properties: Optical Heterodyne Force Microscopy (OHFM) relies on the use of a modified atomic force microscope in which light modulated at a megahertz frequency is focused onto the sample to induce thermal waves inside it. The surface of the sample vibrates through thermal expansion at an amplitude dependent on the sub-surface structure of the sample. We simultaneously vibrate the cantilever base at a nearby megahertz frequency. By detecting the cantilever vibration at the difference between the ultrasonic frequency and the optical modulation frequency we can image the transient thermal expansion of the sample with nanometre lateral spatial resolution and micron resolution in depth. This shows an image of a buried structure. The top Cr layer hides a hole under the surface 2 microns in diameter. This is clearly resolved in the OHFM phase image, sensitive to the sub-surface propagation of megahertz frequency thermal waves. A short movie of the OHFM scanning process is shown below. 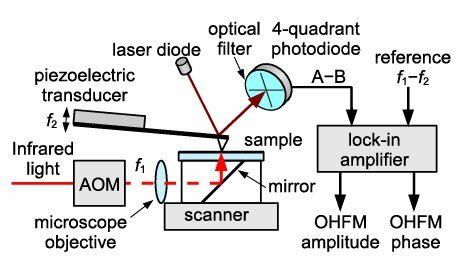 Now we have extended this method to profiling the optically heated micron-sized spot on the sample using a modified setup. (See 'Nanoscale thermoelastic probing of megahertz thermal diffusion', M. Tomoda, O. B. Wright, and R. Li Voti, Appl. Phys. Lett. 91, 071911, 2007.) 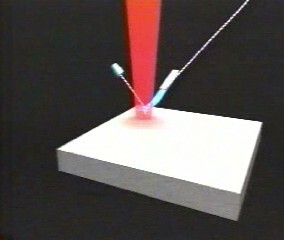 This makes use of optical incidence from the opposite side of the sample, as shown below. Modified OHFM setup. The sample is a thin metal film on a transparent silica substrate. AOM refers to an acousto-optic modulator that chops the light. 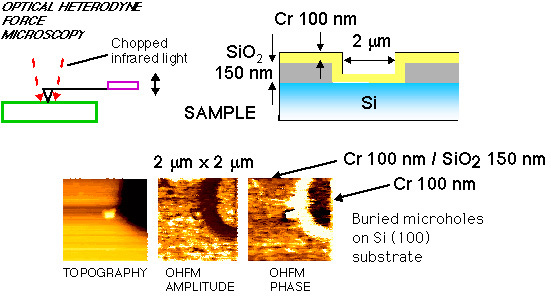 The AFM tip is scanned laterally with respect to the optical spot, allowing lateral thermal diffusion to be investigated on nanometre length scales at MHz frequencies. More details are given in the List of publications.